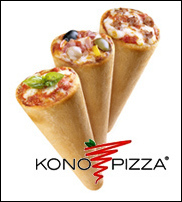 This is a rather ingenious foodstuff – a conical pizza. a number of conical pizza bases are prepared, then have tomato paste spread on the inside and then filled with a number of pizza toppings and cheese. Then you cook it and eat like an ice cream. It’s very original and comes in lots of flavours. The official site is here. I re-formatted my iPod today for use on the PC version of iTunes. Seems to be rather un-Apple to go to all of this for just a platform change. I own a 4GB silver 3rd generation Nano (Below). I have just now linked both my PS3 and my PC over a program called Folding @ Home. 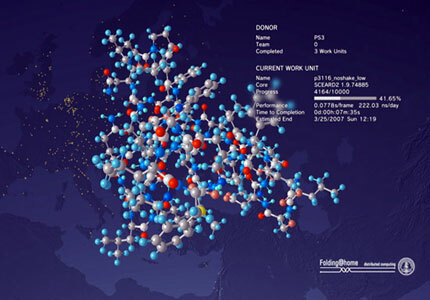 It is not designed to link PS3’s to PC’s, but rather it is a protein folding simulation that comes in both computer and console formats. You can set both to work together in one online ‘team’, the practical upshot of which is that you can cure cancer while playing video games and reading your e-mail (or anything else similar). The F@H homepage can be found here and so can the PC client. The PS3 client is built-in and can be used with an internet connection. A site called www.gigapan.com hosts some very interesting pictures indeed. These are huge gigapixel panoramas taken from up to a hundred pictures digitally stitched together to form hi-resolution vies of a certain area. There are panoramas of Obama’s inaugaration ceremony, Singapore, Boston, beaches and loads more. Here is the pic of Obama’s inaugaration, which led me to the site. Picked up the catalogue for my local gamestore and was mildly surprised to see a 4-page spread on the Nintento DSi and all of it’s features. I personally am not looking forward to it, most especially due to the removal of the GBA port. This creates no end of problems as you say bye-bye to your Internet browser set, your copy of Guitar Hero: On Tour and any and all GBA games you own. This and a further reduction in screen size and a power button move will probably hurt sales but not enough to put a dent in what will be generated by the new features which include built-in Wi-Fi, two cameras (because you really, really need to take two pictures at one time) and a rather sparkly new online shop, similar to the Wii Shopping Channel. This apparently can your account from the Wii if you like, but I’m not too sure on that. Also in the realm of hardware there is the addition of the rather un-needed SD card slot, while at the same time R4’s are doing the same thing for far cheaper. I might report more as the DSi becomes more well-known here in Australia. A group of German students who run a robotics club at VGH Bogen have created three amazing and complex contraptions for some sort of competition. It’s hard to know exactly what the details are, because the site is in German and Google can’t translate most of it. But videos of these giant construction machines are available on YouTube, and are therefore embedded below. Enjoy.